India celebrates 70th Republic Day today honouring the date on which the Constitution of India came into effect on 26 January 1950 replacing the Government of India Act (1935). President of South Africa Cyril Ramaphosa is the chief guest for this year's Republic Day parade. 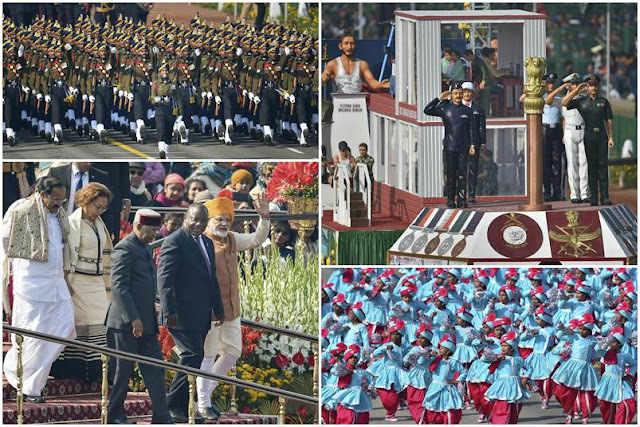 The theme of the 70th Republic Day parade is 'life of Gandhi' which is a tribute to the father of the nation Mahatma Gandhi on his 150th birth anniversary. A total of 22 tableaux, 16 from states and union territories and six from central government ministries and departments, were part of the cultural parade overall theme of which was life and ideals of Mahatma Gandhi. Lance Naik Nazir Ahmad Wani of Jammu and Kashmir was posthumously conferred with the Ashoka Chakra, India's highest peacetime gallantry award, by President Kovind. The award was received by his Mother and Wife. The parade started from Vijay Chowk and proceeded towards the Red Fort grounds. For the first time, this year 4 veterans of Indian National Army who fought valiantly against the imperial forces also took part in Republic Day Parade. They were Shri Parmanand, Shri Lalti Ram, Shri Hira Singh and Shri Bhagmal. For the first time, all women marching contingent of the Assam Rifles took part in the parade. Twenty-six children who have been awarded Pradhan Mantri Rashtriya Bal Puruskar this year also participated. Main Battle Tank of the Indian Army, T- 90 Bhishma, Infantry Combat Vehicle Ballway Machine Pikate, K-9 Vajra-T, Ultra Light Howitzer and Akash weapon system were the main draws at the parade. The grand finale of the parade was a spectacular flypast by the Indian Air force. The ceremony culminated with the national anthem and release of colourful balloons. The government said the Jawaharlal Nehru Port Trust (JNPT) has become India's only port to get listed among the top 30 global container ports. "The JNPT, India's premier container port got listed amongst the top 30 container ports globally, as per the latest Lloyds Report. According to the shipping ministry, JNPT notched up five spots, to be 28th on the list, compared to its previous ranking. Jawaharlal Nehru Port also is known as Nhava Sheva, is the largest container port in India. It is located in Navi Mumbai, Maharashtra. JN Port is the biggest container handling port in India handling around 55% of the country’s containerized cargo. For the first time ever, India has been ranked in Bloomberg’s 2019 list of most innovative countries in the world. India has grabbed the 54th spot among 60 countries in the Bloomberg Innovation Index with a score of 47.93 out of 100. South Korea has topped the Bloomberg Innovation Index for the sixth time in a row with a total score of 87.38. Germany ranked second, Finland stood on the third spot. According to Bloomberg, the countries and sovereigns have been ranked on the basis of their overall ability to innovate considering seven-equal weighted metrics -- research & development intensity, manufacturing value-added, productivity, high-tech density, tertiary efficiency, researcher concentration, patent activity. Bloomberg Innovation Index has been constituted for the seventh time. According to a Bloomberg report, Bloomberg has published top 60 economies out of 95 economies analysed for the ranking process for the year 2019. Each economy has been assigned a score from 0-100 on the basis of seven equal-weighted metrics. The Union Cabinet chaired by Prime Minister Narendra Modi has approved the signing Memorandum of Understanding between India and Kuwait for cooperation on the Recruitment of Domestic Workers. Around 3,00,000 Indian domestic workers deployed in Kuwait would be major beneficiaries. This includes around 90,000 female domestic workers. State-run telecom firm BSNL has partnered with French company Be-Bound to offer data connectivity through SMS in areas where there is no Internet connectivity or signal breaks. The technology will be embedded in mobile apps. The app will send a command to Be-Bound server in case it does not get data connectivity for SMS-based connectivity. “Be-Bound server will facilitate SMS connectivity after getting a command from the app. The app will also send SMS from user’s account because for connectivity we need to send sms to and fro. The Union Cabinet, chaired by Prime Minister Narendra Modi has given ex-post facto approval for amendment to the 'Framework on Currency Swap Arrangement for SAARC Member Countries' to incorporate a 'Standby Swap' amounting to $ 400 million operated within the overall size of the Facility of $ 2 billion. The facility would enable India to provide a prompt response to the current request from SAARC member countries for availing the swap amount exceeding the present limit prescribed under the SAARC Swap Framework. An Indian Cabinet approved the Framework on Currency Swap Arrangement for SAARC Member Countries on March 1, 2012 with the intention to provide a line of funding for short term foreign exchange requirements or to meet balance of payments crises till longer term arrangements are made or the issue is resolved in the short-term itself. Former president Pranab Mukherjee, Bharatiya Jana Sangh leader Nanaji Deshmukh and singer Bhupen Hazarika were on 25 January 2019 conferred the country's highest civilian award Bharat Ratna. In an official statement, the government said Deshmukh and Hazarika have conferred the award posthumously. Pranab Mukherjee, fondly known as 'Pranab Da', was the president between 2012 and 2017. Bhupen Hazarika was born on September 8, 1926 in Sadiya, Assam, British India, to Nilakanta Hazarika and Shantipriya Hazarika. He was the eldest of their ten children. Bhupen Hazarika, popularly known as the 'Bard of Brahmaputra',. He was honoured with the Dadasaheb Phalke award for lifetime contribution to development of Indian cinema in 1993. In May 2017, Prime Minister Narendra Modi inaugurated India’s longest bridge (9.15 kms), which runs over the Lohit river in Assam. Modi named the Dhola-Sadia bridge after Bhupen Hazarika. Pranab Mukherjee was born in Mirati in Birbhum District of West Bengal on December 11, 1935 to freedom fighters. Mr Mukherjee acquired a Master's degree in History and Political Science as well as a degree in Law from the University of Calcutta. He worked as a professor and a journalist before taking the plunge into politics following his election to the Rajya Sabha in 1969. He got his first ministerial post in Indira Gandhi's cabinet in 1973. He was sent to the Rajya Sabha by the Congress in 1975, 1981, 1993 and 1999. He has served on the Board of Governors of the IMF, World Bank, Asian Development Bank and African Development Bank. He was rated one of the best five Finance Ministers of the world in 1984 according to a survey conducted by "Euro Money" Journal published from New York. He assumed office as the 13th President of India on July 25, 2012. The government on 25th January 2019 announced names of the Padma awardees 2019 on the eve of the 70th Republic Day. One of the highest civilian Awards of the country, the awards are conferred in three categories, namely, Padma Vibhushan, Padma Bhushan and Padma Shri. The recipients include veteran journalist Kuldip Nayar (posthumous), cricketer Gautam Gambhir, Indian choreographer Prabhu Deva, actor Kadir Khan (posthumous) among others. Teejan Bai an exponent of Pandavani was among the four Padma Vibhushan awardees, the Bachendri Pal is among the 14 Padma Bhushan recipients. Padma Vibhushan: For "exceptional and distinguished service", it is the second-highest civilian award in India. Padma Bhushan: For "distinguished service of a high order", it is the third-highest civilian award in India. Padma Shri: Awarded for "distinguished service", it is the fourth-highest civilian award in India. It will be announced every year on 23rd January, the birth anniversary of Netaji Subhash Chandra Bose. The Award carries a certificate and a cash prize of 51 lakh rupees. Sultan Abdullah Sultan Ahmad Shah, the ruler of the Malaysia state of Pahang, was named the country's new king. The leaders of Malaysia's royal houses, known as the Conference of Rulers, elected the 59-year-old Sultan Abdullah to a five year term under a system of rotational monarchy that is unique to Malaysia. Sultan Abdullah will be sworn in as the nation's 16th Yang di-Pertuan Agong, or head of state, in a ceremony on January 31. The Sultan is heavily involved in sports governance -- he is the current president of the Asian Hockey Federation and a council member of FIFA, the world football body. Christophe Joseph Marie Dabiré has been appointed as the new Prime Minister of Burkina Faso. Dabiré, a former commissioner representing Burkina Faso at the West African Economic and Monetary Union, served as a minister under former president Blaise Compaoré, with Roch Marc Christian Kaboré as prime minister between 1994 to 1996. He led the country’s Department of Health between 1992-1997 and oversaw the Department of Secondary, Higher Education and Scientific Research between 1997-2000. Russell Baker, the Pulitzer Prize-winning writer who penned thousands of columns for The New York Times, passed away at his home in Leesburg, Va. He was 93. Russell Baker won the Pulitzer Prize for commentary in 1979. It was the first Pulitzer for commentary awarded to a humorist.